I spent Wednesday night in the company of a rare and unusual beauty. No, I wasn't at a party with the latest young Insta-model; the beauty was of the inanimate kind in the form of an incredible jewel. 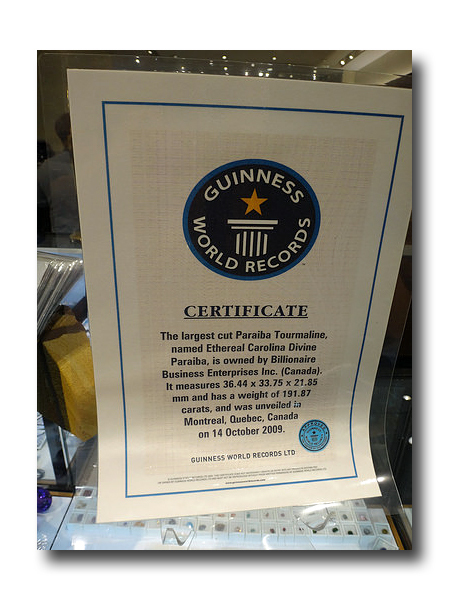 This almost 200 carat (191.87 to be exact) Paraiba Tourmaline from Brazil was listed in October 2009 as the Guinness World Record holder for largest cut Paraiba Tourmaline and became known as "Ethereal Carolina Divine Paraiba." 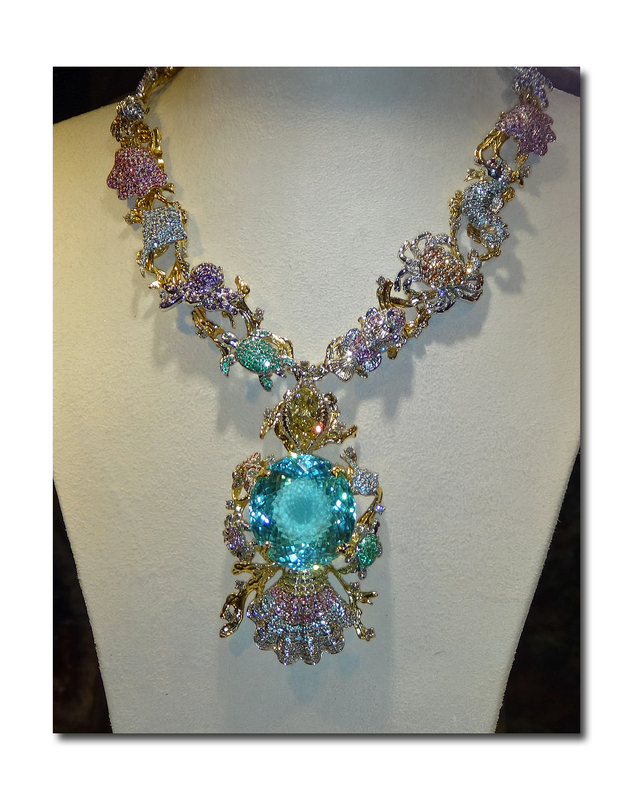 In late 2013 it was set in a necklace designed by Moneca Kaufmann of Kaufmann de Suisse Jewelers (of Montreal and Palm Beach, Fl) to become the Paraiba Star of the Ocean Jewels Necklace, which is how it remains to this day. 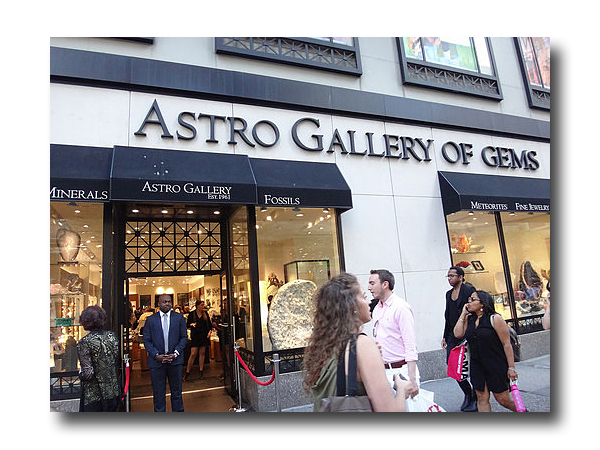 The necklace was on view, courtesy of Art Bodega Magazine at Astro Gallery of Gems, on 38th and Fifth Avenue, for only one night as part of a world tour, where I met its designer and got to hear a bit about its history. The ultra unique, bluish green, glowing, luminescent stone (for every 10,000 diamonds mined, only one Pairaiba Tourmaline turns up) is currently owned by Vincent Boucher, a Montreal Financier and CEO of Billionaire Business Inc. Ms. Kaufmann had previously designed jewelry for various gemstones that he had brought to her. With this one she helped him file for its GIA (Gemological Institute of America) certification. When he asked her to design a piece of jewelry to showcase it, she was initially stymied. "First, I was thinking about it as the king of the gemstones and I tried to make it into a lion" she said. "I didn't like it at all. Then I got inspired by the sea." One look at the necklace in the case definitely brings to mind the Caribbean! The piece itself, although majestic, is also whimsical and includes a large yellow diamond directly above the show-stopping tourmaline. White and pink diamonds, and other pave colored stones are woven in a chain of turtles, crabs, fish, octopus and various sea creatures, all leading to the spectacular luminescent pendant enveloped in a multi-colored shell design. Since this event was for the current Summer 2015 issue of Art Bodega, several of those featured in its pages attended. 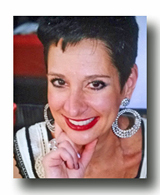 Those included L.A. Dawson, who wrote "The Stone Cold Truth About Style" on the magazine's last page, about (you-guessed-it) precious stones, and Holly Signorelli, author of "Do You Know Where Your Money is?" with a several page lifestyle spread. 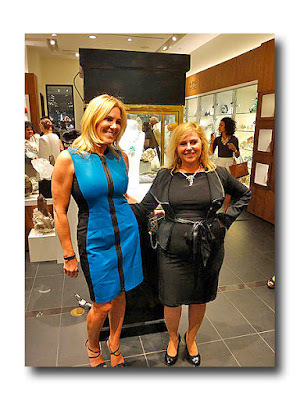 Dawson's article featured turquoise stones which she also sported at the event, in earrings contrasting with her coral dress, while Signorelli wore a scuba inspired dress in black and teal, perhaps also inspired by the ocean theme. I spoke with Gisela A. Reis, a Sales and Marketing Professional at Astro Gallery about the museum-like store and their clientele. "We get people of all ages and all nationalities, tourists, locals, and celebrities such as Cameron Diaz, who was on the guest list " she said. "We have items for just a few dollars and all the way up!" She remarked that she'd like to see security camera footage of the gallery after closing, musing that much like "Night At The Museum" perhaps the dinosaur skeleton and other featured creatures move around. She gave me the gallery's list of stones and their properties which is quite extensive. For Tourmaline (of all colors) it reads: Dispels fear, negativity, and grief. Promotes healthy environment, tranquil sleep, balance in relationship, self-expression. Eases compulsiveness. All of which got me musing on who should own this special necklace. Tourmaline (along with Opal) is the birthstone for October. I immediately realized whose birthday just happens to be in that month? Yes, I'd like to think that I just saved Kanye West hours of trouble trying to decide what to gift Kim with this year. This is the absolute perfect gift for her! Not only is it her birthstone (check), she loves things that look like Elizabeth Taylor would have worn them (check), it's a one-of-a-kind item (check), it's blue for the boy that they're expecting and can double as a "push present" ie. gift to the mother for a new baby (check), not to mention all of the properties just stated above about Tourmaline ("easing Impulsiveness" may even help Kanye resist those grandstanding "moments" that he's famous for). There you go Mr. West, I got you covered with the perfect baby mama/birthday gift! If you can blow $25K on champagne in one night drinking with Drake, Future and 2 Chainz, you can certainly afford this bauble for your "one and only." No need to thank me...just send along my 15% finder's fee!